Last month’s issue of Music Insider Magazine dealt with some of the differences between trademark law and copyright law, including the kinds of penalties that may come from infringement of either type of intellectual property. One additional facet that warrants explanation is the importance of choosing a method by which you — the trademark or copyright holder — can and/or should enforce those rights against potential infringers. In particular, it’s worth knowing how to have content removed from someone else’s website or social media profile that potentially infringes your copyright(s), and why the difference between trademark and copyrights may be an important piece of knowledge when you’re trying to remove this content. Let’s say, for instance, that you want to know how much traction your band has on the Internet. A Google search for your band’s name yields several noteworthy results, including a Facebook profile purporting to be a promotional page for your band, but it’s not run by anyone connected with your band. Moreover, the unofficial page features your band’s name and logo, album artwork, pictures of you and other members, and provides links that direct users to websites where they can listen to your songs for free. Understandably, you want these pages taken down. And lucky for you, Facebook (like most major websites with user-generated content) provides “takedown” notice forms, which create official reports that some content on the site may infringe your copyrights in violation of the Digital Millennium Copyright Act (DMCA). Facebook (or its administrators and/or lawyers) would then examine the page and decide whether or not to remove the infringing content or take down the page altogether. Before you start filling out these forms, make sure you know which rights are being infringed. According to a recent ruling from the U.S. District Court for the Northern District of California, an incorrectly filled out DMCA takedown notice may itself be a violation of the DMCA. In fact, the DMCA holds that any proprietor who materially misrepresents that certain material infringes its copyrights is liable for damages incurred by the alleged infringer (Title 17 of the U.S. Code Section 512(f)). In CrossFit, Inc. v. Alvies, plaintiff CrossFit, Inc. (the company that created the very popular CrossFit® fitness training program) brought a trademark infringement action against Jenni Alvies, in part for content posted on Alvies’ “CrossFit Mamas” Facebook page, on which she posted daily workout routines and on which other individuals would post updates on their workout progress. Alvies additionally sold nutritional shakes through the blog and paid for Google AdWords advertising for her websites, all allegedly without CrossFit, Inc.’s authorization. Before filing the suit, CrossFit sent a takedown notice to Facebook under the DMCA, requesting the removal of Alvies’ “CrossFit Mamas” page, which Facebook subsequently did take down. In response to CrossFit’s lawsuit, Alvies counterclaimed that CrossFit made a “material misrepresentation” by using a DMCA takedown notice to assert its trademark rights, which the act does not cover. In other words, Alvies alleged that by asserting trademark rights under the DMCA — which provides remedies only for copyright infringement — CrossFit was itself violating the DMCA. CrossFit moved to dismiss this counterclaim, arguing that Alvies did not suffer any damages, but the court denied the motion, holding that Alvies allegedly received income from her activities and arguably suffered damage when the source of this income was removed via an improper DMCA takedown notice. Notwithstanding any future appeal, this decision may allow some social media users who have infringed another’s copyright or trademark rights to place monetary liability on the holders of those rights who don’t carefully select the method for enforcing the rights to their marks or copyrighted works. 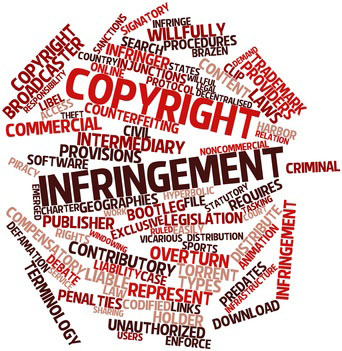 Therefore, if you seek to remove material from any website that you believe is infringing, make sure to read carefully which procedures to follow for the types of rights you’re asserting, and make sure your copyrights — and not your trademarks and/or any other rights your band has — are being infringed. Want to protect your assets? Ultimately, it’s your responsibility to enforce your rights and follow the proper process to take down copyright infringers. Most websites make this a fairly simple task. Keep in mind, however, that this task can be made much simpler if you know the exact nature of your assets, and what you’re entitled to do to prevent them from being misappropriated.